The black and blue diamonds radiating from this exceptional ring give it a trendy edge that makes it exquisitely unique. Stunningly beautiful, this gorgeous diamond ring is the perfect accessory for the one who has stolen your heart. A one-of-a-kind treasure. Beautifully crafted in 14K rose gold, this 3 1/5 CTW Round Black and Blue Diamond Multi Stone Engagement Ring showcases a brilliant 2.91 CT, triple AAA black diamond in an elegant 4-prong setting at the center. 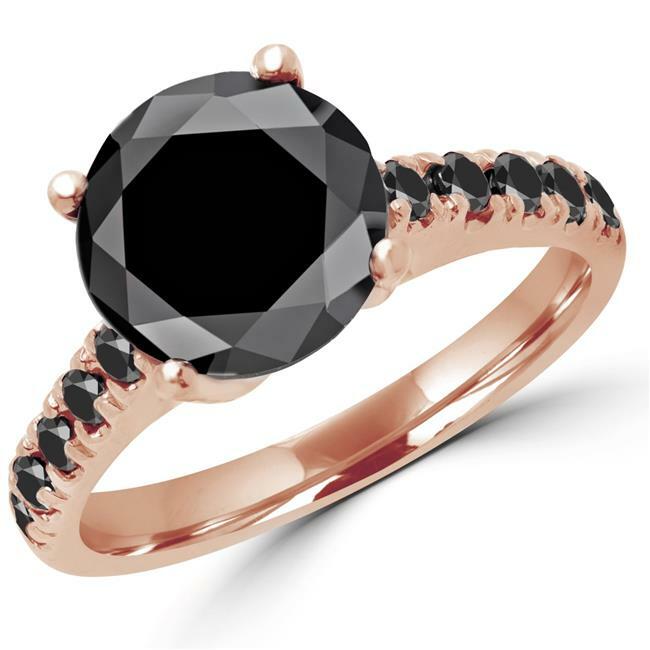 The black diamond is accented by a row of 0.3 carat blue diamonds along the ring's shank. The blue diamonds have a VS2-SI1 clarity rating. This is a gorgeous ring that will dazzle and delight.